Our goal is to negotiate price and terms that are best. 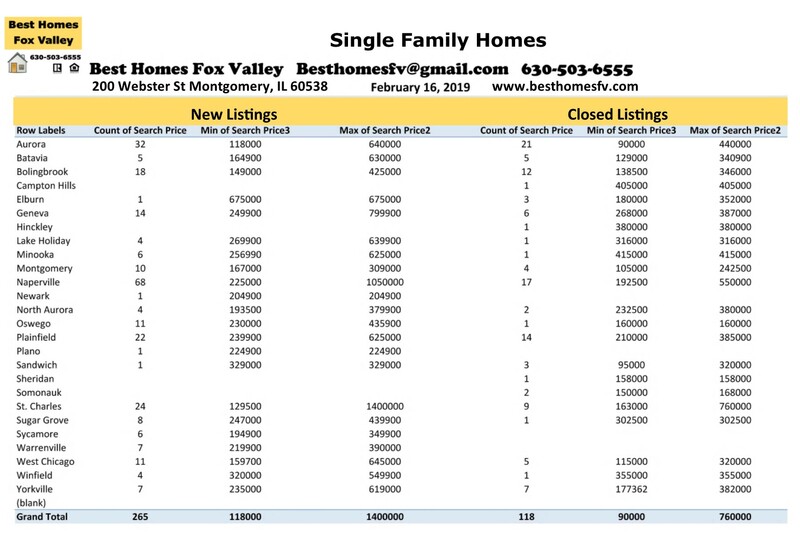 Market update Fox Valley-February 16 2019. New listings were down this week. 265 this week compared to 325 last week. That puts at 771 for the month so far. January New listings were 878 total so we are only halfway through the month and we have almost met last months total. They will keep picking up as we head into Spring market. Closed listings were up this week. 118 this week compared to 84 last week. That puts us at 343 for the month so far. January Closed listings were 407 total. We have almost met that total as well. Closed listings should increase as we head into the end of the month when most Buyers like to close. Contracts accepted by Sellers this week were slightly up this week. 224 this week compared to 209 last week. That makes 614 accepted contracts so far this month. There were 608 contacts accepted by Sellers in the month of January. We have already past those totals. This gives you an idea of the closings that will be coming up if they make it through the process of inspections, attorney review and loans getting approved. Short Sales accepted by Sellers this week were 6. Last week there was only 1. 2 were in Bolingbrook & Naperville this week and only 1 each in Montgomery & Yorkville. Now they will be submitted to the lender to see if they will also accept. Sellers accepted contracts this week that are contingent on the closing of the Buyers current home. 4 with a kick-out clause of 72 hours, 9 with 48 hours and 1 with 24 hours. Contingent contracts were also accepted by Sellers that the Buyers still need to sell and close on their current home. 4 with a kick-out clause of 72 hours and 3 with 48 hours. Call us at 630-503-6555 Jeffery Szymczak-Broker ext 104, Bobby Burson-Broker ext 105 or Kristine Heiman-Managing Broker ext 101. Our goal is to negotiate price and terms that are best whether you are buying or selling a home. We make it our business to find the perfect fit for your needs. Now is the time to get your home on the market so you don’t miss out on the best time of the year to sell. Spring market is when it is the busiest of the year. If you are thinking about buying a home you need to get pre-qualified with a loan officer so you know the price range and what type of loan will work out best for you. 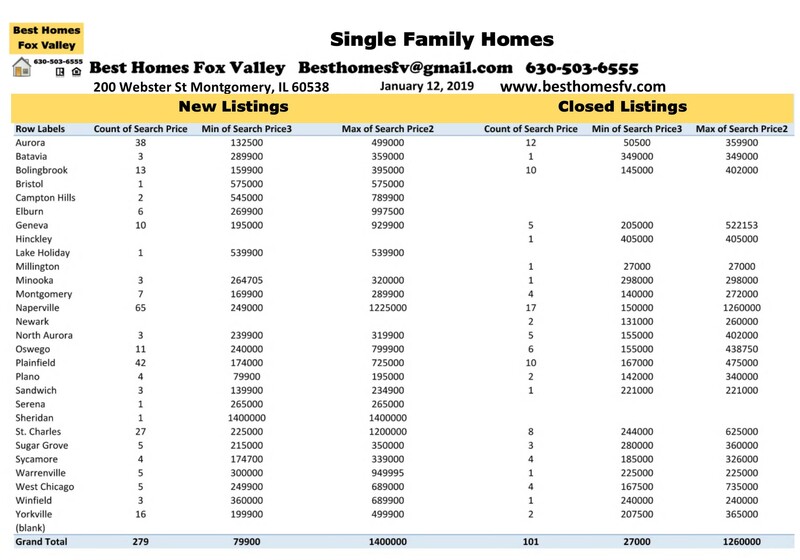 Market update Fox Valley-February 16 2019. Have a great week! 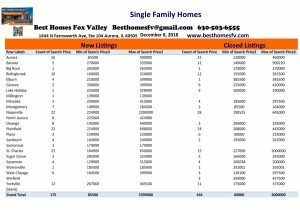 Best Homes Fox Valley-Search for a home today! 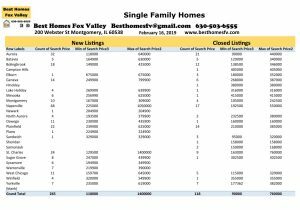 Market Update Fox Valley-January 12 2019. New listings are really starting to pick up. 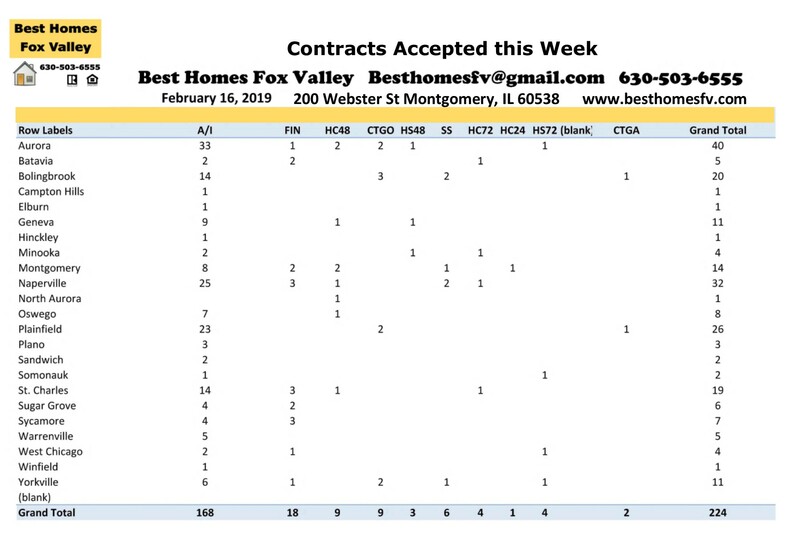 279 new listings this week compared to 166 last week. Buyers you now have more choices to choose from. If you need to update your preapproval letter now is the time to do that. It should be no older than 30 days. Closing this week were pretty close to last week. 101 closings this week compared to 109 last week. Last week some of them were ones that didn’t close by the end of December and had to carry over into the new month. The beginning of the month is usually slower with closings. They should pick up as we get closer to the end of the month. That is when most buyers want to close so they can bring less money to closing. Contracts accepted this week were slightly up. 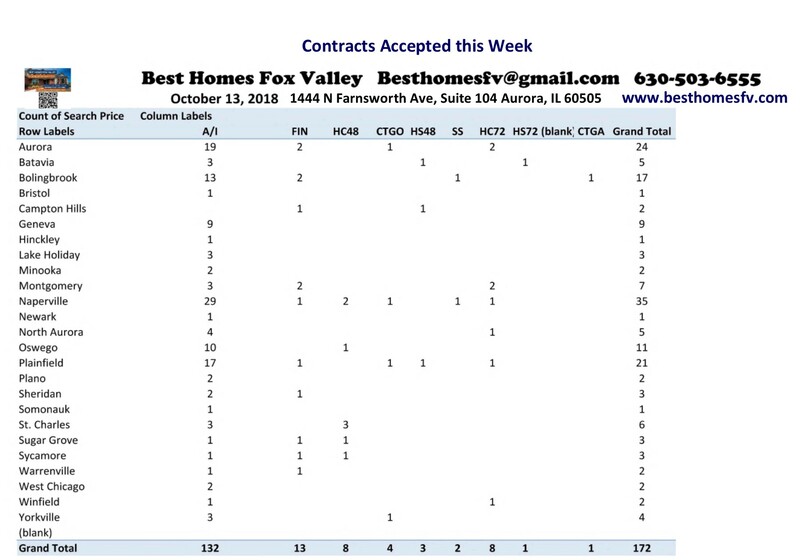 129 contracts accepted by Sellers this week compared to 114 last week. Things are starting to pick back up after the holidays. More inventory might get even more people out this week. If you are thinking about selling now is a good time to beat the Spring rush where you will have more competition to sell. Accepted contracts for short sales doubled this week. 8 this week compared to 4 last week. Now they will be submitted to the lender to see if they will also accept as written. These numbers are still very low and we hope they stay that way. 2 of those were properties in Aurora and 1 each in Batavia, Bolingbrook, Montgomery, North Aurora, St Charles/Campton Hills & West Chicago. Sellers accepted contracts this week that are contingent on the Buyer closing on their current home before purchasing. 3 with a kick-out clause of 72 hours, 2 with 48 hours and 1 with 24 hours. Contracts were also accepted by Sellers that are contingent on the Buyer selling and closing on their current home before purchasing. 1 with a kick-out clause of 72 hours and also 1 with 48 hours. Call us at 630-503-6555 Jeffery Szymczak-Broker ext 104, Bobby Burson-Broker ext 105 or Kristine Heiman-Managing Broker ext 101 with all of your real estate questions. Our goal is to negotiate price and terms that are best whether you are buying or selling a home. We make it our business to find you the perfect fit for your needs. Do you need to find a loan officer? We can make some recommendations of ones we have successfully worked with so you can get preapproved. The letter they provide you with will need to go with an offer when we find a home that you like. Thinking about selling this year? Contact us to update the value on your home in the current market and let you know what you need to do to get your home market ready. We will provide you with a net proceeds that is an estimate of expenses to sell. This will be updated when an offer comes in and we know all of the terms so you can make an informed decision. This market update is for Single Family homes only. If you would like information on other types of properties let us know. We would be happy to provide it to you. Market update Fox Valley-January 12 2019. Have a great week! Market Update Fox Valley-December 8 2018. Improved market this week! 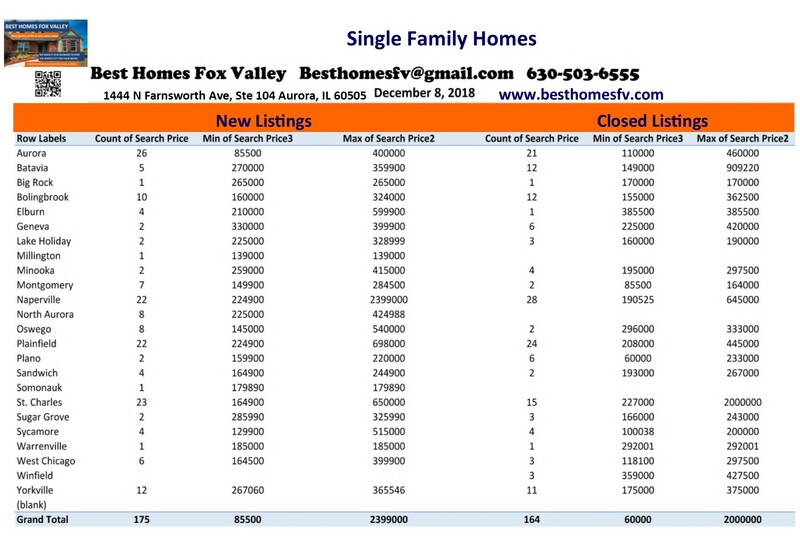 New listings this week 175 compared to 156 last week. We had to get past Thanksgiving and a snow storm. Closings were down this week. 164 this week compared to 180 last week. That is the difference between the last week of the month to the first week of the month. These numbers should improve as we head into the end of the month and end of the year. First 2 million dollar sale in Kane County this year! It was in St Charles and it was a cash deal. Contracts accepted this week were slightly up. 138 this week compared to 128 last week. We just had to get past a holiday and a snow storm. Short sales were also slightly up this week. 6 this week compared to 2 last week. They still remain low so that is a good thing. 2 of them were in Aurora. 1 each in Bolingbrook, Plainfield, St Charles/Campton Hills and Sycamore. Now they will be submitted to the lender to see if they will also accept contract as written. Sellers accepted contracts this week that are contingent on the Buyer closing on their current home. 2 with a kick-out clause of 72 hours and 1 with 48 hours. Contracts were also accepted by Sellers that are contingent on the Buyer selling and closing on their current home. 5 with a kick-out clause of 72 hours and 2 with 48 hours. Call us at 630-503-6555 Jeffery Szymczak-Broker ext 104, Bobby Burson-Broker ext 105 or Kristine Heiman-Managing Broker ext 101. Our goal is to negotiate price and terms that are best. We make it our business to find the perfect fit for your needs. Let us update the current value on your home in today’s market. We will provide you with a net proceeds that will show you an estimate of expenses. Let you know what you need to do to get your home market ready. If you are thinking about purchasing a home your first step is to contact a loan officer and get pre-qualified. They will provide you with a letter that will go with an offer when we find a home. It will say what type of loan you are going for and how much you qualify for so a seller will feel comfortable accepting your offer. 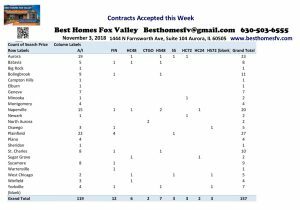 Market Update Fox Valley-December 8 2018. Have a great week! 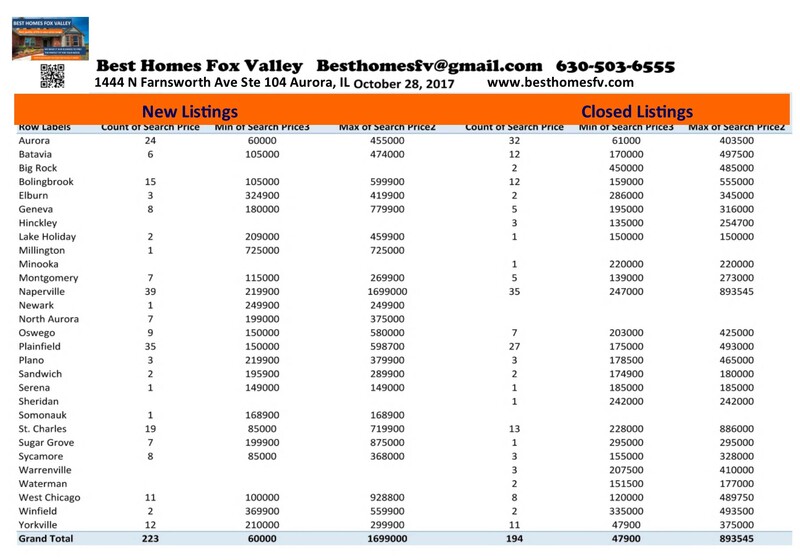 Market update Fox Valley-November 3 2018. The market was slightly down this week. 219 this week compared to 223 last week. I guess Halloween was not too much of a distraction. Closed listing this week were significantly up. 262 this week compared to 192 last week. Monday, Tuesday and Wednesday were the last 3 days of the month. Buyers like to close the end of the month so they bring less interest to closing. Contracts accepted this week were down. 157 this week compared to 177 last week. Price adjustments might need to be made to get more interest on existing homes. Short sales are still very low. 3 accepted this week compared to 6 last week. Now they will be submitted to the lender to see if they will also accept as written. Sellers accepted contracts with a contingency of Buyers closing on their current home. 3 with a kick-out clause of 72 hours, 6 with 48 hours and 2 with 24 hours. Contracts were also accepted by Sellers that the Buyer still needs to sell and close on their current home. 3 with a kick-out clause of 72 hours and 7 with 48 hours. Call us at 630-503-6555 Jeffery Szymczak-Broker ext 104, Bobby Burson-Broker ext 105 or Kristine Heiman-Managing Broker ext 101. Our goal is to negotiate price and terms that are best whether buying or selling a home. If you are thinking about selling a home let us update the value in the current market and provide you with a net proceeds so you have an idea of expenses to sell. Thinking about buying? You will need to contact a loan officer to get qualified. They will let you know the type of loan that is best and what price range you should stay in. You will be provided with a letter that will go with an offer when you find a home. The interest rate you are offered will be determined on your credit score. If you need to work on it they can help you to do the right things to bring it up. 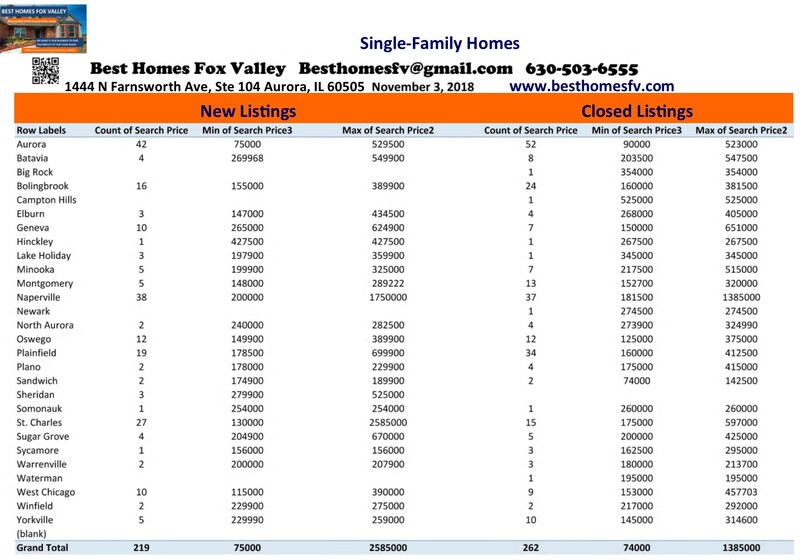 Market update Fox Valley-November 3 2018. Have a great week! 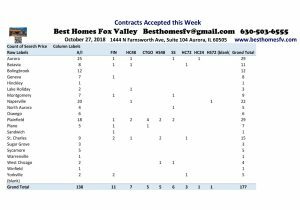 Market Update Fox Valley-October 27 2018. New listings this week were down. 223 this week compared to 269 last week. Closed listings were up. 192 this week compared to 188 last week. That is to be expected with the last week of the month. I posted above the picture of this week and this week last year. Talk about being right on target. You can’t compare closer than this. 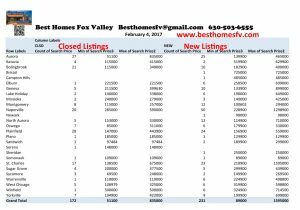 This week 223 new listings and 192 closed. Last year this week 223 new listings and 194 closed. Contracts accepted this week were down. 177 this week compared 192 last week. Short sales this week are staying consistently low. 6 this week compared to 4 last week. Now they will submitted to the lender to see if they will also accept as written. Seller’s accepted contracts that are contingent on the Buyer’s current home closing. 3 with a kick-out clause of 72 hours, 7 with 48 hours and 1 with 24 hours. Contracts were also accepted by Seller’s that the Buyer’s current home needs to sell and close before purchasing. 1 with a kick-out clause of 72 hours and 5 with 48 hours. Selling a home during the holidays can be challenging and exciting. Priced right you can be in a new home before the holidays. You will not have as much competition as you do in Spring market. We can update the value of your home in the current market and provide you with a net proceeds so you have an estimate of expenses. This will be updated when an offer comes in so you can make a good decision. If you are just starting to look at homes you will want to learn about the different types of loans and the process. Then contact a loan officer to determine the price range that works for you. You will be provided with a letter from the lender showing what you qualify for. This will be submitted with your offer when you find a home. It needs to be updated if it is older than 30 days. Keep up to date with interest rates. They might be on the way up. The interest rate you will be offered will be determined on your credit score. You should always check to see if you qualify for any help with down payment assistance or closing costs. If you are a teacher, veteran or police officer you definitely should check. Illinois and some communities also offer assistance. Check the community website that you are looking in to see if they also offer any help. Are you a Veteran? You might want to check the requirements and process for getting a VA loan. Find a lender that does a lot of these loans so everything goes smoothly. 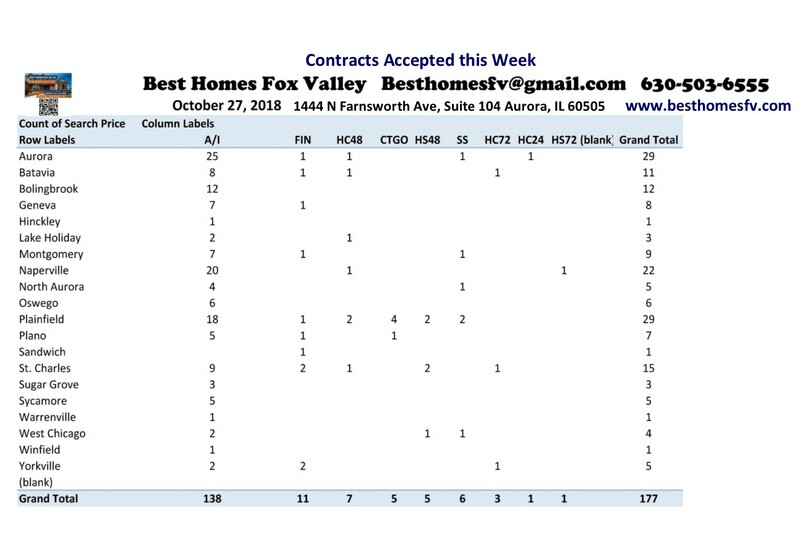 Market update Fox Valley-October 27 2018. Have great week! 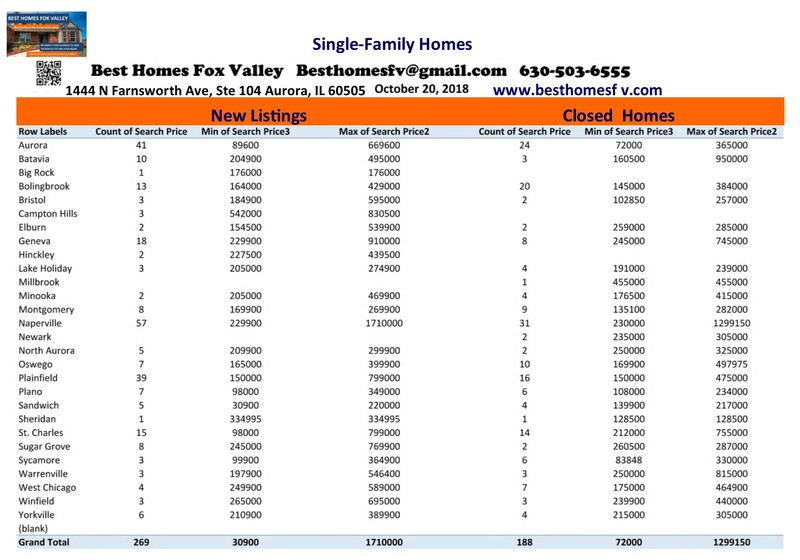 Market update Fox Valley-October 20 2018. 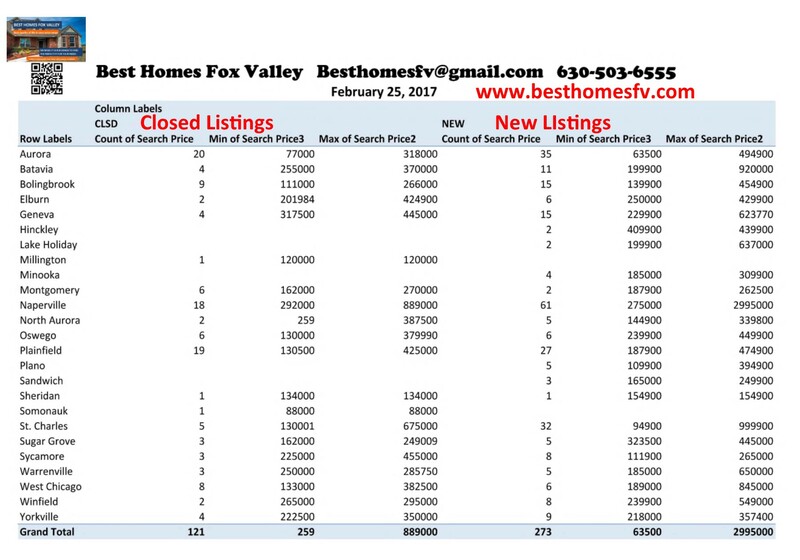 New listings were pretty consistent with last week. 269 this week compared to 277 last week. We love consistency! Closed listings this week improved. 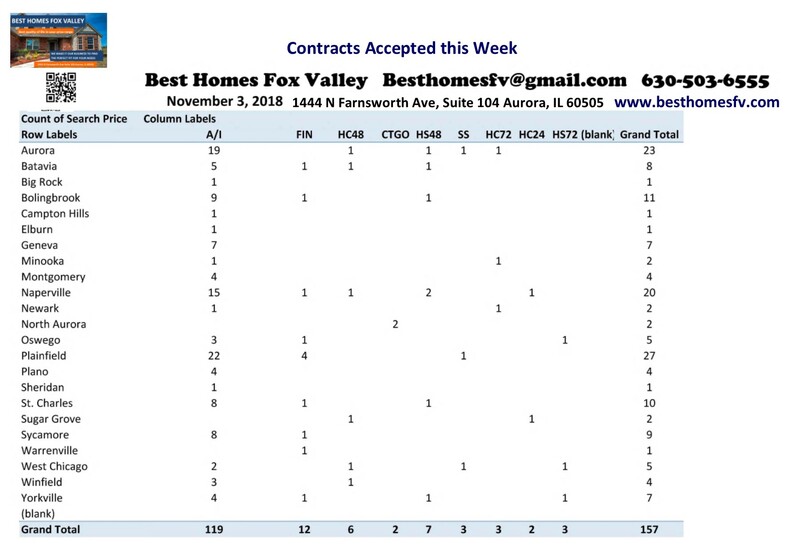 188 closed homes this week compared to 144 last week. They should improve more next week with the end of the month when most buyers want to close. 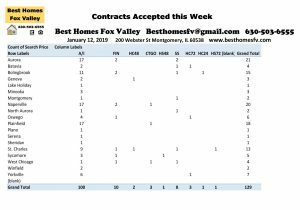 Contracts accepted this week by Seller’s were higher this week. 192 this week compared 172 last week. Happy to see more Buyer’s out this week looking and making decisions that are agreeable with Seller’s. Short sales this week stayed low. 4 this week compared to 2 last week. Now they will be submitted to the lender to see if they will accept contract as written. This could take a while. Seller’s accepted contracts this week that are contingent on the Buyer closing on their current home before purchasing. 6 with a kick-out clause of 72 hours, 7 with 48 hours and 1 with 24 hours. Contracts were also accepted with contingencies on the Buyer selling and closing on their current home. 3 with a kick-out clause of 72 hours, 3 with 48 hours and 2 with 24 hours. We can update the value of your home in the current market. Provide you with a net proceeds so you can see the expenses and what you might walk away with at closing. This will be updated when an offer comes in and we know all the terms the buyer is requesting. If you are wanting to purchase a home you might want to take a look at the different types of loans and the process. You will need to contact a loan officer and get pre-qualified. They will provide you with a letter showing what you qualify for and what type of loan. This will go with an offer when you find a home. It needs to be no more than 30 days old or the loan officer will need to update it. Are you a Veteran? You might want to take a look at the requirements and process for getting a VA loan. There are many programs out there with help with a down payment and/or closing costs. Illinois and some communities offer down payment assistance. Go to the website of the community you are looking at and see if the offer anything. It doesn’t hurt to look. You will want to keep an eye on interest rates. You never know when they might change. Your credit score will determine what interest rate you are offered. Market update Fox Valley-October 20 2018. Have a great week! Market Update Fox Valley-October 13 2018. New listings this week were pretty consistent with last week. 277 this week compared to 273 last week. We love consistency! Come on buyers there is still homes to look at that you have not seen yet. Closed listing were down this week. 144 this week compared to 188 last week. Homes closing right now went pending right as school was starting and there was a slow down then. They should pick up as we head into the end of the month. This is the first time that I have seen Aurora & Plainfield have more new listings than Naperville. Contracts accepted this week were down. 172 this week compared to 207 last week. Price adjustments might need to be made to get things moving again. Take a look to see if there is anything that you can spruce up. 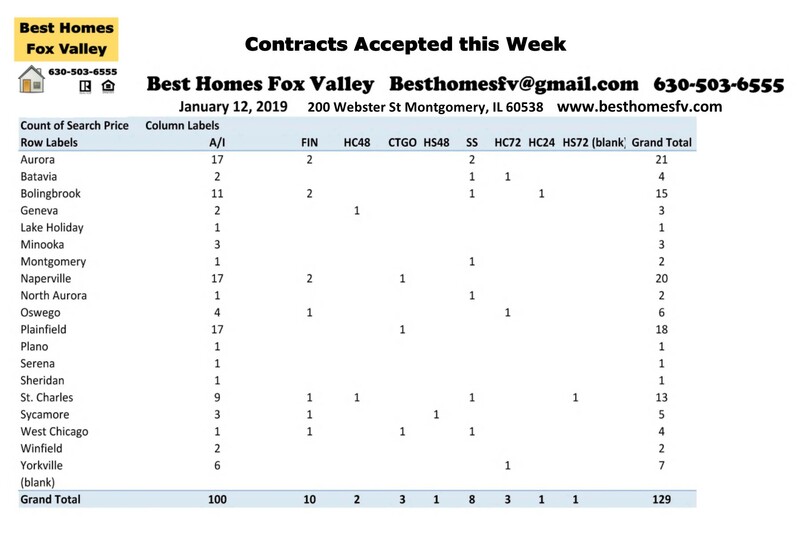 Naperville was still ahead with accepting the most contracts this week. Short sales are staying consistently low. 2 this week compared to 5 last week. This is great to see them staying so low. Now they will be submitted to the lender to see if they will also accept the contract as written. Sellers accepted contracts that are contingent on the buyers home closing before purchasing. 8 with a kick-out clause of 72 hours and 8 with 48 hours. Contracts were also accepted that are contingent on the buyers home selling and closing before purchasing. 1 with a kick-out clause of 72 hours and 3 with 48 hours. Call us at 630-503-6555 Jeffery Szymczak-Broker ext 104, Bobby Burson-Broker ext 105 or Kristine Heiman-Managing Broker ext 101. Our goal is to negotiate price and terms that are best whether buying or selling a home. We are here to answer all of your real estate questions. Let us update the value of your home in the current market and provide you with a net proceeds so you have an idea of expenses and what you might walk away with. We will update this when an offer comes in and we know all the terms so you can make an informed decision. We will let you know what you need to do to get it market ready. If you are thinking about purchasing a home you might want to take a look at the different types of loans and the process so when you talk to a loan officer to get pre-qualified you will be ready with any questions that you have. After they pre-qualify you and let you know the range and what type of loan will work best for you they will provide you with a letter. That letter will go with an offer when you find the right home for you. Sellers want to see that letter before they will commit to negotiate. Are you a Veteran? You might want to take a look at the requirements and process of getting a VA loan. Take a look at current interest rates. You will want to keep an eye on them. One thing about the economy improving it causes interest rates to rise. Your credit score will determine what interest rate you are offered. Down payment resources is something everyone should check out. Especially if you are a police officer, teacher or veteran. Illinois and some communities also offer assistance. You will want to check out the community website that you are looking to move to. Market update Fox Valley-October 13 2018. Have a great week! Market Update Fox Valley October 7 2017. A jump in new listings this week! 301 this week compared to 273 last week. That is great for buyers that are waiting for new homes to come on the market to go and view. Let’s keep them coming! Closed homes this week were down. 208 this week compared to 260 last week. This was to be expected with the beginning of the month. You will see more at the end of the month. 208 is still a good number for the start of a month. If you are an investor looking for something under $100,000 you can see above there are not too many listed this week. If you are a home owner thinking about selling take a look at your community and see the sold homes and the price range. Prices have definitely gone up. 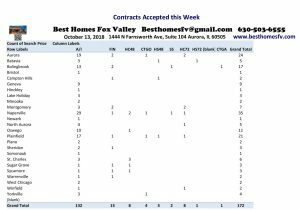 Market Update Fox Valley October 7 2017-Accepted Contracts. Accepted contracts this week were right on target with last week. 216 this week compared to 217 last week. The market is continuing to be consistent. That is a good thing! There were 8 short sales accepted this week by sellers. Now they will go on to see if the lender will approve as accepted or if they will change it to what they need. Some of buyers don’t understand that the listed price is not what the bank told the agent to list it for. Contracts were accepted by sellers with a contingency that the buyer needs to close on their current home before they can close theirs. The buyers already have accepted a contract on their home. 4 of them with a kick-out clause of 72 hours and 5 with a 48 hour kick-out clause. Sellers also accepted contracts this week that the buyer still needs to sell their home. The buyers do not have a contract on their home yet. They might or might not already have their home on the market. 1 with a kick-out clause of 72 hours, 5 with 48 hours and 3 with a 24 hour kick-out clause. Contact us with all of your real estate questions. If you are thinking about selling your home we will do a home valuation for you to let you know what it is worth in the current market. Let you know what you need to do to get your home market ready. If you are thinking about moving in the next 6 months now is the time to get in touch with a lender to see if you need to work on any credit issues or bring up your score to get the best interest rate. We can recommend loan officers that we have worked with successfully if you don’t know who to contact. You can also go to CFPB to learn more about the process. Down payment resource is another place to go to. Search for homes anytime whether you are looking to purchase or sell. You can keep an eye on the market. To get the price and terms that are best we will explain the process and what you need to do and not do. We make it our business to find the perfect fit for your needs. Activity this week Fox Valley 02/25/17 was busy with closings for the end of the month. Most buyers that need a loan to purchase choose to close at the end of the month so they can bring less money to closing. You need to pay interest from the day of closing to the end of the month so they choose as few days as possible. The communities with the most activity this week are Aurora Closed listings-20 New listings-35, Bolingbrook Closed listings-9 New listings-15, Geneva Closed listings-4 New listings-15, Naperville Closed listings-18 New listings-61, Plainfield Closed listings-19 New listings-27 & St Charles Closed listings-5 New listings-32. The second week of February saw the most New listings. We have Monday & Tuesday left of this month for closings so Tuesday will probably be a busy day. We are looking forward to March as we get into the Spring market. Whether you are a buyer or seller this is the time to get going. Buyers need to get pre-qualified before they can start to look at homes. Call your loan officer or we can recommend a few for you to contact so you can decide who you would like to work with. CFPB will give you some information about the buying process and we would be happy to explain it to you. If you are not paying cash the loan type you decide on that is best for you might determine the homes that you view. Sellers in today’s market need to be ready to go. Finish up all your projects and get your home listed now. We can do a market analysis on your home for free and let you know the value in today’s market. We will explain the process if it has been a while since you were last in the market. Providing you with a net proceeds to show you expenses for selling your home and an estimate of what you will come out with at closing is part of our process. Accessibility for showing your home is very important. You do not want to miss out on showings. Buyers might find something and not come back to your home. If you have pets get a crate or have a back up plan so it does not prevent a showing. 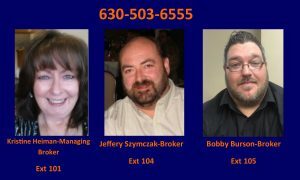 Contact us with all or your real estate questions. The mild weather this winter has kept the market active. January and February are usually slow months. 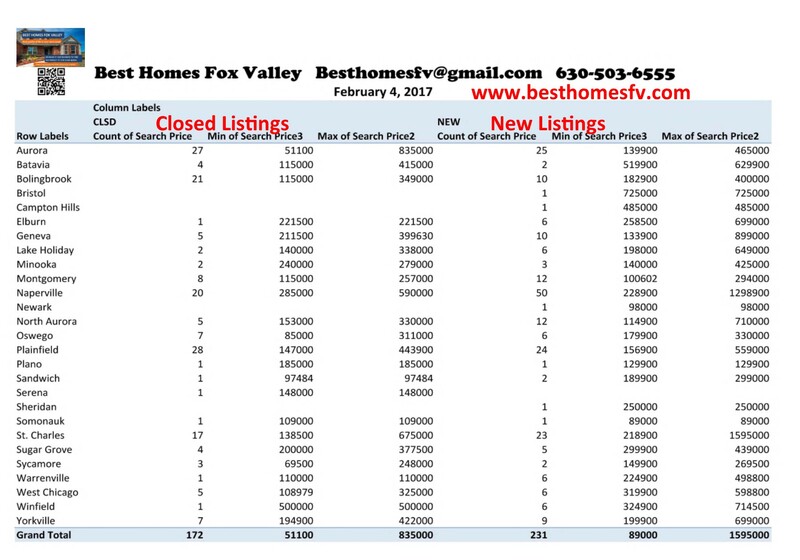 You can see the activity this week in Fox Valley 02/25/17 is staying pretty consistent so far this year from week to week. Start searching for homes on our website . You will see “search properties” in the top right corner. After you click on that scroll to the bottom of the page and click on “more options” so you can decide the criteria that you need for your search. Call Jeff Szymczak-Broker ext 104 or Kristine Heiman-Managing Broker ext 101 at 630-503-6555. We are very accessible unless we are with clients and will call you back as soon as we can. 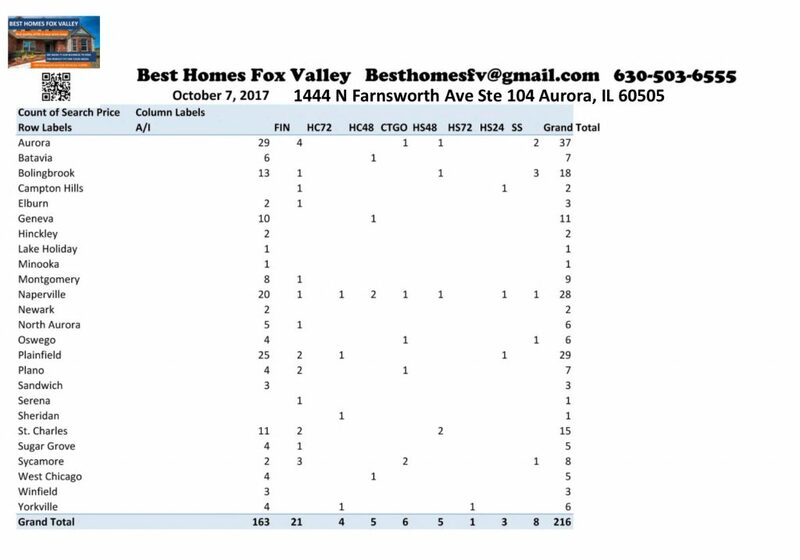 Best Homes Fox Valley is here to make it our business to find the perfect fit for your needs. 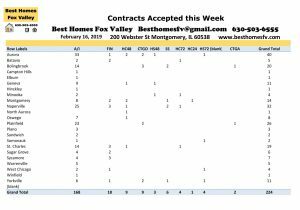 Activity this week 02/04/17 Fox Valley area of Single Family homes. I switched back to listing towns instead of Kane & Kendall county. Some towns are in multiple counties and it is harder to track that way then by towns. Activity picked up a little more this week. It is edging up higher every week leading up to Spring market. Click on the photo and it should get larger so you can see it or we can email it to you. Elburn, Geneva, Montgomery, Naperville, North Aurora & St Charles are towns that have more listings than sales this week. Inventory is still low. We like to see more new listings than sales so buyers have choices. It is a great time to be a seller! Values have been increasing especially with low inventory. Request a market analysis so we can let you know what value your home is in the current market. Do you need more space, closer to work or want to get something smaller with less maintenance? Job transfer, marriage, divorce or more children might also be a reason to move. We will provide you with a net proceeds so you have an idea whether it makes sense to move now. First step is to talk to a loan officer to get pre-qualified. We can recommend some loan officers to contact so you can make the choice of who you want to work with. Go to CFPB to get information about owning a home and the process if you are a first-time buyer or have not bought a home in a while. Down payment resource is another place to look to see if you qualify for help with a down payment. Check out the community you are looking in also to see if they offer any programs on purchasing in their community. Contact us with any questions that you have. We can get you set up to receive listings of homes as they hit the market so you don’t miss out on anything. You can also go to our website and search for homes anytime. Call us at 630-503-6555 Jeff Szymczak-Broker ext 104 or Kristine Heiman-Managing Broker ext 101 or email us at besthomesfv@gmail.com. We are keeping an eye on the market.